With the recent cutbacks by all the bus companies in Plymouth it is clear that quite a few buses will be leaving the local fleets. 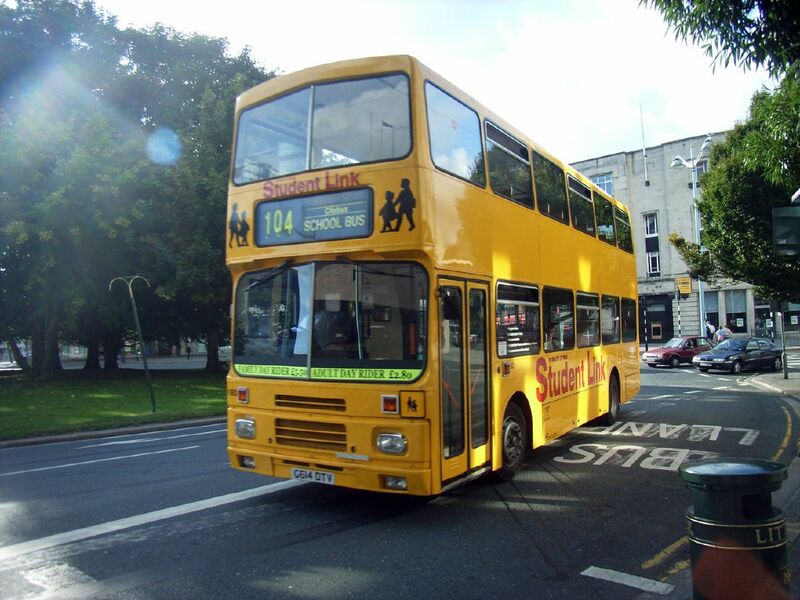 One bus now confirmed as being sold is Plymouth Citybus 180 which has been reported in Aztec West, Almondsbury, Wiltshire still in yellow Student Link livery. It was originally planned that all of these Volvo Citybus double deckers would be replaced by the Volvo East Lancs buses from London, although of course that changed with the extra competition from First meaning many of them are in all day service on the 26 so the older buses are still needed for schools services. Just in case anyone is having difficulty finding Aztec West in Wiltshire it is off the A38 adjacent to junction 16 of the M5. I believe this is within what is known as South Gloucestershire, within two miles of Bristol itself. Wiltshire is still a good few miles away and near Junction 17of the M4. Hope that clarifies any confusion. have you heard first are dropping the 7 and 11? Marc Reddy departs to manage in Dorset. Western Greyhound the main Cornish operator. First pulling out of North Devon (See bus fayre mag). First pulling off the 13 and 17. Withdrawal of evening services in Plymouth. It seems things are not well with First and the Westcountry. I cant say I wont be glad to see the back of this PLC down here. Shoddy buses, poor evening services, trying to cream off Go Ahead Citybus profits and only interested in big profits, which you aren't that big here. And when has Bus Fayre mag ever reported truth?! Anyway... G614OTV is now with South Gloucestershire Bus & Coach, Patchway. Not to far from where it was sited acutally, maybe it was on delivery? Its been spotted working various school routes for them.